The Format List is Controlled Inconsistency - by Marianne Burkett – WELCOME TO OUR INTERNATIONAL SUPPORT! So… you want your clocks to be slightly different each hour and you painstakingly create many, many clocks. That isone way to do it. However, in MusicMaster there is a lesser-used feature that I really like that will save you time now and in the future… the Format List! What is a Format List and where do you find it in MusicMaster? By placing this Format List in a clock 2 times you would see a nice pattern for your currents with a 2:1 ratio for your “A to B” categories. I have 5 songs in A and 5 in B and average 6 spins a day for A and 4 for B.
I personally like to control the current to gold flow so I might create 2 lists. A current Format List and a gold Format List. Here’s a gold pattern. Now that you know how to build Format Lists, where do you find this in MusicMaster? Dataset/Clocks/Format List tab. Click new. You’ll see what looks like an empty clock. Drag in the categories you want in your list. Arrange the categories so you’ll have the correct ratios for power to secondary, new to old. Save. I control my currents with 2 positions in the hour and have nearly perfect rotations. I don’t know which gold category I’m going to hear out of the stopsets or top of the hour. I know where my currents are playing but from day to day but not whether it will be an A or a B in a specific position. So, it takes several days for someone listening on their way to work to hear that same current again at the same time. If you’re building an internet stream or planning a start up or just revamping your clocks, consider the Format List as an effective tool for “controlled inconsistency”. 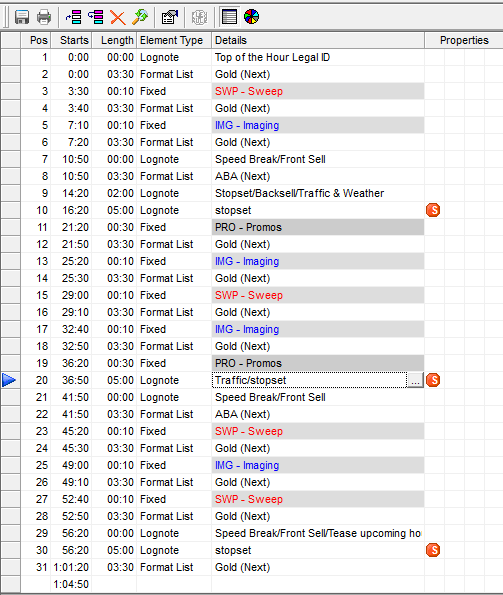 The clients I have that use Format Lists, love them. They are versatile. You don’t have to change all your clocks if you want to change the clocks… you just change your Format Lists up. If you’re a bit apprehensive about using the Format List feature, try it first with a few non-music categories like imaging liners & jingles. Create a pattern and replace them in the clocks with a Format List.